In 1996, the residents and businesses of the Triangle and surrounding areas were made aware of development plans by the NCDOT to create I-540, a continuous highway system surrounding Raleigh, NC. For the past few years, the project has been in a lull due to the impact of completing the Southeast Extension. The Complete 540 project has been extensively reviewed with multiple public meetings to hear from those that are potentially affected. Early February 2016, the NCDOT decided the “Orange” route of I-540 to be the most acceptable route to finish construction of I-540. What is the “Complete 540” Project? The Complete 540 project (Southeast Extension) is a multi-lane expressway that spans Wake and Johnston counties. When completed, 540, known as the Triangle Expressway will surround Raleigh, NC. Why Completing 540 is Important? As business and population growth continue in the Triangle, it is important to have adequate resources to accommodate the increase in daily traffic. Completing the 540 project will alleviate much of the congestion commuters experience on I-40, I-440, NC 42, NC 55 and Ten Ten Road now and in the future. The remaining 540 section requiring completion has recently been approved. The “Orange” route has been found to be the most acceptable corridor to develop the roadway as it impacts local businesses and residences the least. The NCDOT has determined that completing the project in 3 phases will be most environmentally and economically cost-effective plan. Below are the phases and the sections of roadway in the order of development. Although the NCDOT project committee determined the route of least impact, many Wake and Johnston County residents will be directly affected by construction, interchanges, noise, etc. The towns listed below are the areas of highest concern. What Can You Do if You Live in the Complete 540 Project Area? If your home or business is located within the project area, you will likely be contacted by the NCDOT by letter to specify their intention to use your property for the project. Speaking with an attorney experienced with Eminent Domain and Land Condemnation is the best option to ensure you receive fair and just value for your property. The attorneys of Kirk, Kirk, Howell, Cutler and Thomas, LLP understand the sensitivity of your Eminent Domain and Land Condemnation case. Your home or business is important to you and as such, our goal is to reduce the stress of the case and help you receive the appropriate compensation for the value of your property. 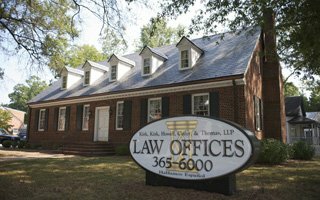 Contact our experienced legal team today by calling (919) 615-2473 or by completing the online contact form below. We look forward to helping you with your case.